Posted March 7th, 2012 by LuAnn Bean & filed under Accounting Principles, Advanced Accounting, All Articles, Auditing, Cost Accounting, Financial Accounting, Financial Reporting and Analysis, Financial Statement Analysis, Fraud Accounting, IFRS, Intermediate Accounting, International Accounting, Managerial Accounting, Uncategorized. Internet radio’s popularity is growing, through smartphone apps and cars that allow smartphone owners to stream Web-served radio through Bluetooth wireless connections. However, this article indicates that there are bad times ahead for this company and the industry. 1. What is Pandora’s share of the total U.S. radio-listening market? 2. What does the article indicate as the problem with the internet radio market? 3. 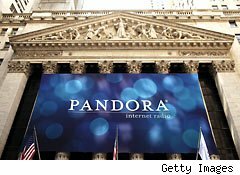 By what percentage did Pandora miss Wall Street revenue projections for Pandora’s most recent quarter?